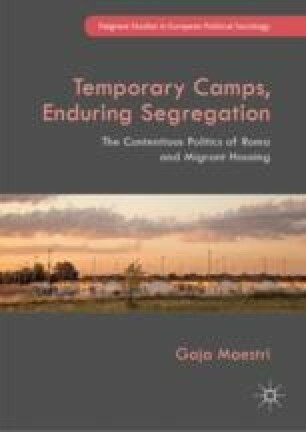 This chapter introduces the three research cases: the Italian Roma camps and the French integration villages and transit estates. The first section on the Roma camps starts with a summary of their history since they were initiated in the 1990s. It then outlines their main characteristics and shows how they have persisted for more than 20 years, despite demands from advocacy groups for their closure. The second part focusses on the integration villages for Roma, their history and their type of persistence, which is characterised by individual extensions granted by the government following civil society mobilisation. The third section on the former transit estates for Algerian migrants charts the period from their formation during the postwar period until their final termination in the 1980s. Finally, the chapter concludes by presenting the methods of data collection employed in the research (in-depth interviews, observation and policy documents analysis) and how I tackled the issues encountered in accessing the field. Adoma. 2014. “Présentation de la contribution d’Adoma à la mise en oeuvre de la circulaire du 26 août 2012 relative au démantèlement des campements illicites.” http://romeurope.org/IMG/pdf/2_presentation_de_la_mission_adoma.pdf. ———. 2014b. “Senza Luce. Le politiche della Giunta Marino, le comunità rom e sinte nella città di Roma e il ‘Best House Rom’.” http://www.21luglio.org/senza-luce-rapporto-sulle-politiche-della-giunta-marino-le-comunita-rom-sinte-nella-citta-roma-il-best-house-rom-marzo-2014/. ———. 2018c. “Camping River. Le verità nascoste nelle pieghe della propaganda.” 1 août 2018. http://www.21luglio.org/21luglio/camping-river-le-verita-nascoste-nelle-pieghe-della-propaganda/. Cohen, Muriel, and Cédric David. 2012. “‘Cités de transit’: The Urban Treatment of Poverty During Decolonisation.” Traduit par Oliver Waine. Metropolitiques, March. http://www.metropolitiques.eu/Cites-de-transit-the-urban.html. Council of Europe. 2012a. Council of Europe Descriptive Glossary of Terms Relating to Roma Issues. http://a.cs.coe.int/team20/cahrom/documents/Glossary%20Roma%20EN%20version%2018%20May%202012.pdf. Cousin, Grégoire. 2013. “L’évacuation de bidonvilles roms. Circulaires et cycles médiatiques.” Métropolitiques, novembre. http://www.metropolitiques.eu/L-evacuation-de-bidonvilles-roms.html. Fassin, Eric. 2010. “Pourquoi les Roms?” Mediapart (blog), septembre 12. http://blogs.mediapart.fr/blog/eric-fassin/120910/pourquoi-les-roms. Legros, Olivier. 2011. “Les ‘villages roms’ ou la réinvention des cités de transit.” Métropolitiques.eu, mars. http://www.metropolitiques.eu/Les-villages-roms-ou-la.html. Legros, Olivier, and Martin Olivera. 2014. “La gouvernance métropolitaine à l’épreuve de la mobilité contrainte des ‘Roms migrants’ en région parisienne.” EspacesTemps.net, mars. http://www.espacestemps.net/articles/lmobilite-contrainte-des-roms-migrants-en-region-parisienne/. Moumen, Abderahmen. 2012. “Housing the ‘Harkis’: Long-Term Segregation.” Metropolitiques, avril. http://www.metropolitiques.eu/Housing-the-harkis-long-term.html.